This fact sheet was developed by the Natural Stone Council as part of a continuous effort to provide reliable and useful information regarding Genuine Stone® products. The information presented has been extensively reviewed by owners and operators of granite quarries and fabrication facilities. To access fact sheets for other stone types and learn more about Genuine Stone®, including the industry’s environmental initiatives, visit www.naturalstonecouncil.org. The United States is one of the chief producers of dimension stone in the world, having generated an estimated 2.73 million tons in 2017. Slate sales often make up the smallest portion of this market. Extensive and productive slate deposits exist in the eastern US, and large volumes of slate are imported into the US from China, India, Brazil, Canada, and Spain. 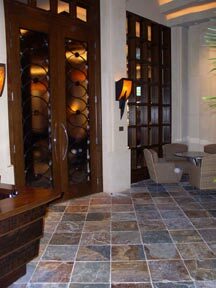 Comparatively small quantities of slate products are exported from the United States to Canada and the UK. Sources: Dolley, T.P. 2018. Mineral Commodity Summaries 2017. U.S. Geological Survey. US Government Printing Office. Washington, DC: 156-157. Stone World Magazine. Monthly Statistics. Accessed 07 August 2018. 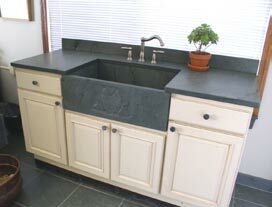 Custom finishes may also be available through your stone supplier. 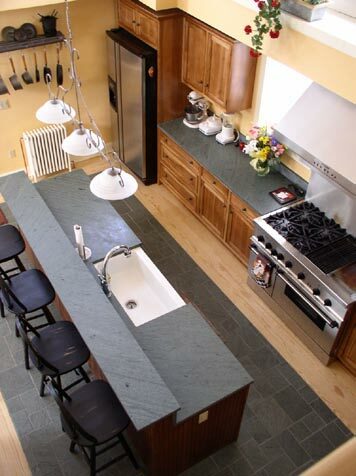 Slate is a metamorphic deposit that evolves from sedimentary rock consisting of clay or volcanic ash. While typically composed of numerous minerals, the predominant constituents include quartz and muscovite or illite. The slate quarried in North America comes mainly from the eastern regions of the United States and Canada, particularly from the slate belts of New York, Pennsylvania, and Vermont. Source: Natural Stone Council. Slate Dimensional Stone Quarrying and Processing: A Life-Cycle Inventory. August 2009. Center for Clean Products. University of Tennessee. A wide variety of slates exist on the market, both foreign and domestic, and these can be drastically different in density, hardness, porosity, and aesthetics. Users should verify that the slate they plan to use is applicable to the demands of the project and has a successful history in such installations. ASTM test data is the most common data available to compare the properties of any stone, including slate. Source: American Society for Testing and Materials. ASTM C-406 Standard Specification for Roofing Slate. 2006.06.01 (E 2006). National Association of Home Builders. 2007. Study of Life Expectancy of Home Components. http://www.nahb.org/fileUpload_details.aspx?contentID=72475. Includes material characteristics, physical requirements, and sampling appropriate to the selection of slate for roofing slate and general building and structural purposes, respectively. The table below lists the required test values for slate; the necessary tests are prescribed by and located in the ASTM standards.